ESO Supernova Exhibition — Could a gamma-ray burst kill off life on Earth? Could a gamma-ray burst kill off life on Earth? A nearby gamma-ray burst could sterilise Earth. These bursts of energy are so powerful that they can briefly outshine the rest of the Universe. Fortunately, the chance of one occurring nearby is slim. 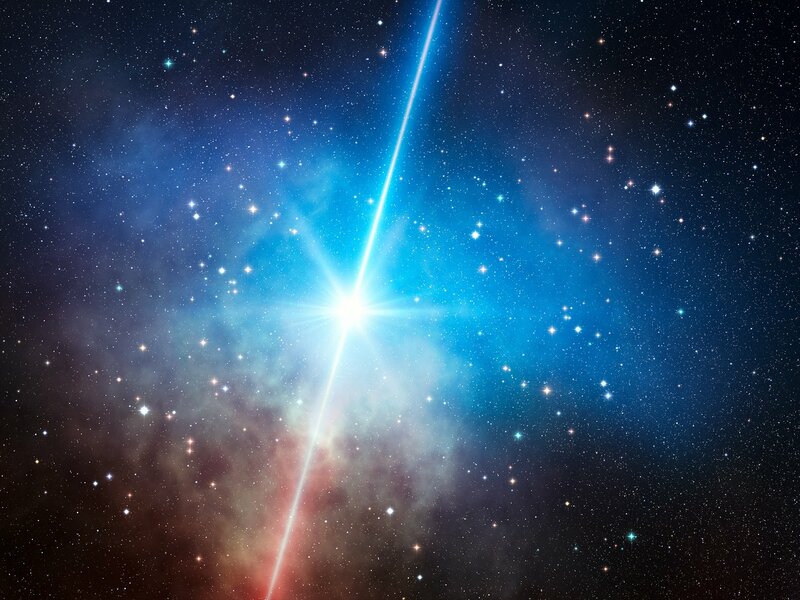 Beaming with energy: The radiation from gamma-ray bursts is strongly beamed in two opposite directions. As long as the Earth is not in the path of one of the beams, it is relatively safe (artist's impression). Crash flash: The collision of two extremely compact neutron stars produces an energetic gamma-ray burst lasting just a fraction of a second (artist’s impression). Death rays: A tsunami of cosmic gamma-rays hitting Earth would set our atmosphere on fire and sterilise at least one half of our planet (artist’s impression). Very brief flashes of energetic gamma-rays from space were discovered in the late 1960s. It took thirty years for astronomers to discover that they originated in extremely remote galaxies. Gamma-ray bursts are associated with the most powerful explosions in the Universe, produced by colliding neutron stars or by the collapse of giant stars into black holes. Luckily their energy is strongly beamed. Only if one went off in our part of the Milky Way galaxy and if the Earth were in the path of the narrow beam, would one half of our planet be sterilised immediately by the deadly radiation. Gamma-ray bursts are observed all over the sky at a rate of about one per day. Their true number is probably much larger. Gamma-rays, along with less energetic radiation at longer wavelengths, are produced when matter from a cosmic explosion is ejected at nearly light speed and then slams into interstellar material. Last breath: Long gamma-ray bursts, lasting from over a second to several minutes, probably result from the catastrophic collapse of extremely massive, rapidly rotating stars (artist’s impression). 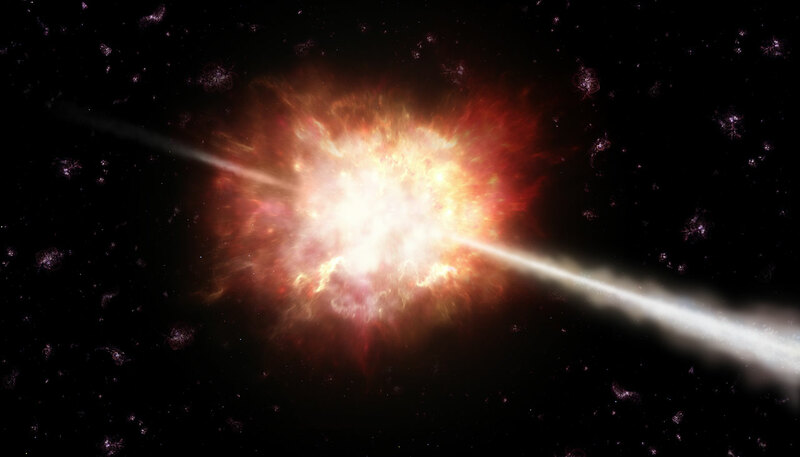 Gamma-ray bursts are the most energetic explosions in the Universe. In less than a second, they produce more energy than the Sun does in 10 billion years.